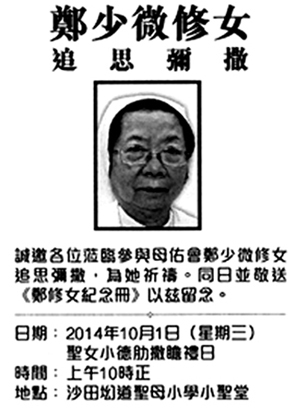 Sister Teresa Cheng Siu Mei FMA, of the Daughters of Mary Help of Christians – the Salesian Sisters, died just before 4pm on 24 March 2014, the feast day of Mary Help of Christians. Her loved ones, many of her students, as well as her Salesian sisters were with her. 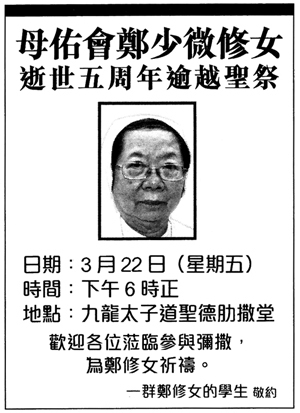 Sister Cheng had been the principal of Daughters of Mary Help of Christians Siu Ming Catholic Secondary School, Kwai Chung, and Our Lady’s College, Wong Tai Sin. A true educator, she was much loved by her students. She had also dedicated herself to the translation of many documents of the Salesian Sisters. All who knew her feel a great loss and sadness at the news of her passing. Please offer a prayer for her eternal repose.